Third meeting and invited for a third year! On Wednesday 22nd of February, the Young People’s Advisory Panel met for a third time in our term. It was fabulous to meet everyone again since October, because lots had happened; both in our lives and our work in helping the Children’s Commissioner for Wales. We started our meeting with an icebreaker (hani-kani-pani-san), which, indeed was very enjoyable and it really did start the day putting a smile on everyone’s faces. After the initial enjoyment, we sat down and discussed the important contents of the agenda. We discussed some of Sally’s projects as a group and we all gave keen views and suggestions on how she could publicise this and make it appealing to children and young people across Wales. I found it very interesting to listen to other people’s views, and coming to a conclusion after a discussion. It was then that the north and the south groups video called, not only giving each of us the opportunity to liaise with our peer group members but to speak to Sally and question her about her work , which again proved very valuable. I found it similarly pleasing that the north and south groups were keen to propose their points on the topics spoken about earlier resulting in us having a larger group conversation. Before we knew it, lunch had approached! In my opinion, this gave us a real opportunity to delve in to great conversation both about our lives since we last met, and things we hope to achieve in the future; this soon lead to us delegating panel members to opportunities to shadow Sally in her events. As well as this, we received our new Children’s Rights t-shirt, which are a great addition! We are now able to promote Children’s Rights on a larger scale now, whilst sporting our new clothes. The second half our meeting was chaired by the chair and vice chair, who really did do a great job! They led us in talk about our next meeting in July and our personal targets as Advisory Panel Members. 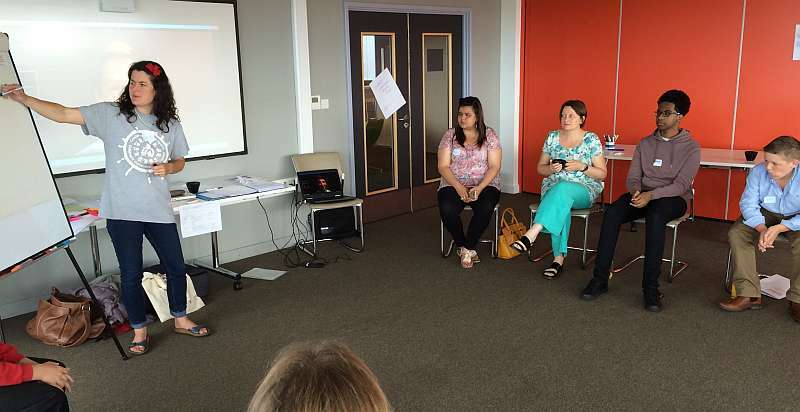 As well as this, they informed us of the Adult Advisory Panel Group meeting which they also attended via video call. Their ability to share this information with the group really did express their authoritative way of chairing meetings. Towards the end of the meeting we were handed a letter from Sally Holland inviting us to stay for another year as panel members so that we could meet and give ‘tips’ to the next generation of Advisory Panel Members. In my opinion, it was a delight to receive this letter. I am sure that I can say this on behalf of all of the team that we are looking forward to our meeting that is scheduled to be held in Mid-Wales!